Results: Uranium prefers petite particles. The radionuclide attaches quickly and abundantly to smaller subsurface grains, according to scientists at Pacific Northwest National Laboratory. The team found that gravel and other large bits adsorbed less uranium(IV) than smaller grains. The larger particles also adsorbed uranium more slowly than the smaller ones. 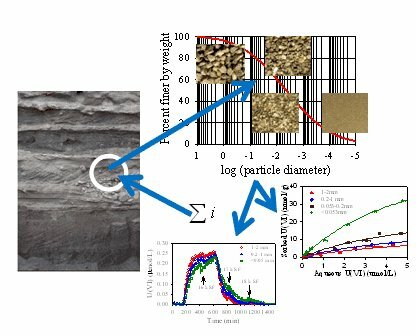 Using this information, the team wrote a series of mathematical formulas to predict uranium adsorption and desorption affinity and kinetics in sediments containing different grain sizes. 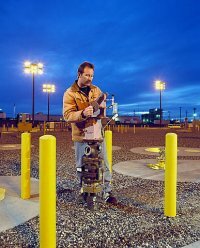 The predictions were successfully tested using sediment from the Hanford Site. Why It Matters: Uranium movement at the Hanford Site is an ongoing concern. Uranium and other radioactive holdovers from weapons production reside under the Site, in southeastern Washington State. These radionuclides are spreading out from their sources and migrating toward the Columbia River, a major waterway. To keep the uranium from the river, scientists need to know how uranium moves, or doesn't, through the complex subsurface. This study demonstrates a way for getting such information for wide areas. With these and other results, PNNL scientists are shaping how uranium's behavior is considered by scientists, cleanup experts, and regulators. Methods: Calculating exactly how much uranium is present and how fast uranium migrates requires scientists to scale measurements from the lab to the field. Essentially, they must take samples measured across millimeters to centimeters and extrapolate them to systems that extend for meters or kilometers. Scientists demonstrated a new concept that allows them to accurately calculate the uranium adsorption in a heterogeneous subsurface sample. "Upscaling is always a challenge," said Dr. Chongxuan Liu, a PNNL geochemist who worked on the study. The scientists on this study began by conducting wet chemistry experiments to determine adsorption characteristics of four grain sizes. The grains were coarse sand (1-2 mm), medium sand (0.2-1 mm), fine sand (0.053-0.2 mm), and clay/silt fraction (<0.053 mm). The scientists used surface area and microporosity instruments, stirred flow cells, and other resources at EMSL. Based on the experimental results, they performed computer simulations to quantify the kinetics and equilibrium thermodynamics in individual size fractions. Then, the team worked out mathematical formulas to sum up the uranium adsorptions in the sediments consisting of different grain sizes. 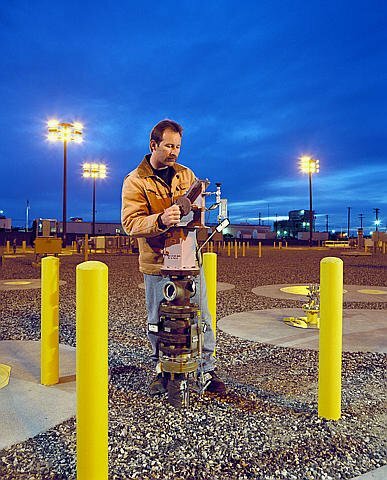 The team tested their approach using contaminated Hanford Site sediment. Their calculations agreed well with the laboratory measurements. What's Next: The team is continuing to examine this approach, drawing upon PNNL's nearly 50 years of geochemistry and biogeochemistry experience. Next, the team will determine if their approach is robust under variable geochemical and hydrological conditions at Hanford Site. Funding: U.S. Department of Energy Office of Biological and Environmental Research through a Subsurface Biogeochemical Research Program Science Focus Area program at PNNL. National Scientific User Facility: EMSL, Environmental Molecular Sciences Laboratory. Research Team: Jianying Shang, Chongxuan Liu, Zheming Wang, and John Zachara, PNNL.